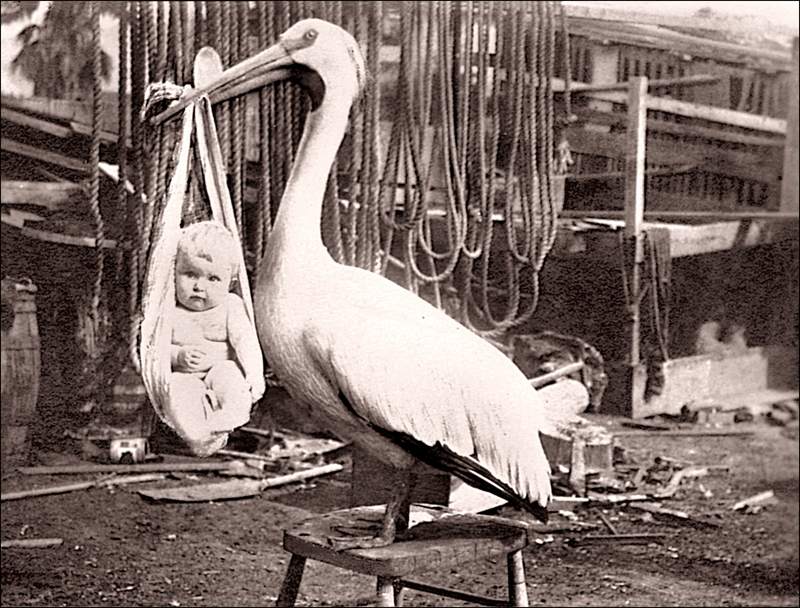 In the days gone by, adults looked for an easier way to explain that awkward question from a child “where do babies come from?” I guess that’s why myths are created because the truth might make us feel uncomfortable. However myths and fables still abound especially when we talk about coal tar sealants. One of the top myths about coal tar sealants (CTS) is that because it is made from “refined coal tar” they are much lower in their most toxic ingredients, PAHs or polycyclic aromatic hydrocarbons. This claim is made not just by applicators who are repeating what they’ve heard, but by PhD’s who really ought to know better. Maybe they just haven’t really looked into it before? Maybe not. The truth is the level of PAHs is reduced by only 50% from concentrations the EPA said contained “significant concentrations of hazardous constituents.” I have challenged these claims in writing and asked for evidence of such, but have never gotten a reply. PAHs stand for Polycyclic Aromatic Hydrocarbons (which are found in asphalt, vehicle exhaust and refined coal tar) and there is a very small percentage of PAHs in ready-to-use pavement sealers. Some use the term “refined” to imply that the impurities or toxicity is taken out. While it is a “refined” as far as going through a refining process to separate lighter materials from heavier ones, but it does not result in an appreciable reduction in the levels of toxic ingredients. So let’s do a comparison. 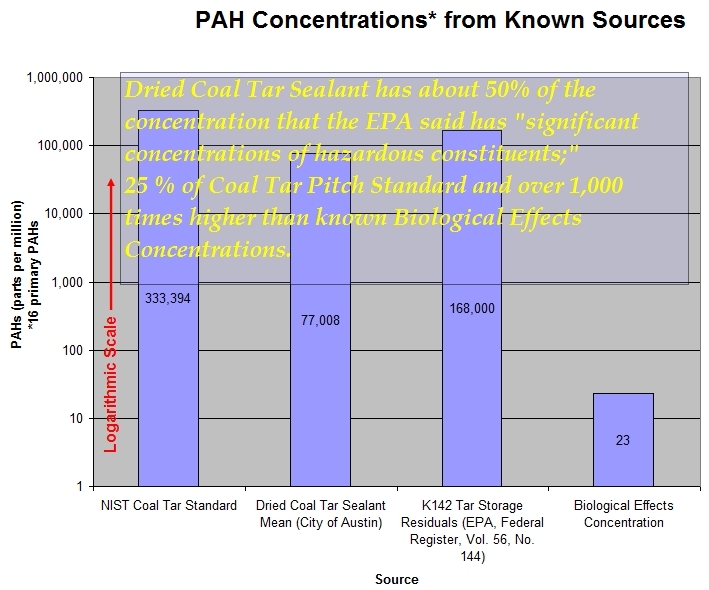 How about comparing a national standard for unrefined coal tar, and EPA-researched levels of PAHs in byproducts of coking coal production to the average PAH concentration in a series of dried coal tar sealant products? As the above graph shows, PAHs are not purified or removed in any great quantity during refining. Yes light oils that contain PAHs are removed, but the overall concentration remains dramatically high and over 3,000 times higher than the biological effects concentration. The Agency has collected data showing that the wastes proposed today for lising typically contain significant concentrations of hazardous constituents that cause carcinogenic, mutagenic. teratogenic, and chronically toxic effects in laboratory animals. The hazardous constitutents are demonstrated to be mobile and persistent in the environment and, thus can reach environmental receptors in harmful concentrations when the wastes are mismanaged. The concentrations and toxicities of hazardous constituents in the wastes are of such a magnitude that even under conservative assumptions regarding the potential for release of these constituents to the environment and their subsequent transport in the subsurface environment, improper management of the wastes poses an unacceptable health risk. These constituents have been detected in the wastes from the production. recovery. and refining of coke by-products in concentrations sufficient to pose a substantial threat to human health and the environment. Benzo(a)pyrene (BaP) is a Class B2 carcinogen. BaP is perhaps one of the most potent animal carcinogens known. Microgram quantities have been shown to induce tumors in a number of experimental animal species via several routes of exposure, including oral, inhalation, and dermal application. (IARC, 1973). Do these descriptions sound like a product that we want on our parking lots, driveways and playgrounds to be tracked inside? *If you didn’t know, one of the main publications of US government perspectives on regulations is the Federal Register. It is intended to bring clarity to the legistlative issues of the day.